PanARMENIAN.Net - American pop singer Cher, who has Armenian roots, has slammed DirecTV for what seems to be a misrepresentation of the movie "The Promise", which portrays a love triangle against the backdrop of the horrors of the Armenian Genocide. "This has no meaning for most, but DirecTV, "The Promise is not about "Ottoman Empire Crumbling into chaos," the "Believe" singer said on Twitter. "It's about the Armenian Genocide. Turks massacred two million innocent Armenians. Women and children were raped and driven into the desert to starve. Men were hung, or worked to death." 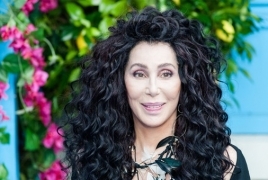 Cher has been vocal in the process of the international recognition and condemnation of the Armenian Genocide. She supported the film "The Promise" by "Hotel Rwanda" director Terry George both during filming and after the premiere.